Robert Nesta "Bob" Marley (February 6, 1945 – May 11, 1981) was a Jamaican singer-songwriter and musician. He was the lead singer, songwriter and guitarist for the ska, rocksteady and reggae bands The Wailers (1964–1974) and Bob Marley & The Wailers (1974–1981). Marley remains the most widely known and revered performer of reggae music, and is credited for helping spread both Jamaican music and the Rastafari movement (of which he was a committed member) to a worldwide audience. Marley's best known hits include "I Shot the Sheriff", "No Woman, No Cry", "Could You Be Loved", "Stir It Up", "Jamming", "Redemption Song", "One Love" and, together with The Wailers, "Three Little Birds", as well as the posthumous releases "Buffalo Soldier" and "Iron Lion Zion". The compilation album, Legend (1984), released three years after his death, is reggae's best-selling album, being 10 times Platinum (Diamond) in the U.S., and selling 20 million copies worldwide. Bob Marley was born in the small village of Nine Mile in Saint Ann Parish, Jamaica as Nesta Robert Marley. A Jamaican passport official would later swap his first and middle names. His father, Norval Sinclair Marley, was a caucasian-Jamaican of English descent, whose family came from Essex, England. Michael George Marley, cousin of Bob Marley, has speculated that the Marleys were of Syrian-Jewish descent, however, this is not conclusive. Norval was a captain in the Royal Marines, as well as a plantation overseer, when he married Cedella Booker, an Afro-Jamaican then 18 years old. Norval provided financial support for his wife and child, but seldom saw them, as he was often away on trips. In 1955, when Marley was 10 years old, his father died of a heart attack at age 60. Marley suffered racial prejudice as a youth, because of his mixed racial origins and faced questions about his own racial identity throughout his life. He once reflected:“ I don't have prejudice against meself. My father was a white and my mother was black. Them call me half-caste or whatever. Me don't dip on nobody's side. Me don't dip on the black man's side nor the white man's side. Me dip on God's side, the one who create me and cause me to come from black and white. ”Although Marley recognized his mixed ancestry, throughout his life and because of his beliefs, he self-identified as a black African. In songs such as "Babylon System", and "Blackman Redemption", Marley sings about the struggles of blacks and Africans against oppression from the West or "Babylon". Marley became friends with Neville "Bunny" Livingston (later known as Bunny Wailer), with whom he started to play music. He left school at the age of 14 to make music with Joe Higgs, a local singer and devout Rastafari. It was at a jam session with Higgs and Livingston that Marley met Peter McIntosh (later known as Peter Tosh), who had similar musical ambitions. In 1962, Marley recorded his first two singles, "Judge Not" and "One Cup of Coffee", with local music producer Leslie Kong. These songs, released on the Beverley's label under the pseudonym of Bobby Martell, attracted little attention. The songs were later re-released on the box set, Songs of Freedom, a posthumous collection of Marley's work. In 1963, Bob Marley, Bunny Wailer, Peter Tosh, Junior Braithwaite, Beverley Kelso, and Cherry Smith formed a ska and rocksteady group, calling themselves "The Teenagers". They later changed their name to "The Wailing Rudeboys", then to "The Wailing Wailers", at which point they were discovered by record producer Coxsone Dodd, and finally to "The Wailers". By 1966, Braithwaite, Kelso, and Smith had left The Wailers, leaving the core trio of Bob Marley, Bunny Wailer, and Peter Tosh. In 1966, Marley married Rita Anderson, and moved near his mother's residence in Wilmington, Delaware in the United States for a short time, during which he worked as a DuPont lab assistant and on the assembly line at a Chrysler plant, under the alias Donald Marley. Upon returning to Jamaica, Marley became a member of the Rastafari movement, and started to wear his trademark dreadlocks (see the religion section for more on Marley's religious views). After a conflict with Dodd, Marley and his band teamed up with Lee "Scratch" Perry and his studio band, The Upsetters. Although the alliance lasted less than a year, they recorded what many consider The Wailers' finest work. Marley and Perry split after a dispute regarding the assignment of recording rights, but they would remain friends and work together again.Between 1968 and 1972, Bob and Rita Marley, Peter Tosh and Bunny Wailer re-cut some old tracks with JAD Records in Kingston and London in an attempt to commercialize The Wailers' sound. Bunny later asserted that these songs "should never be released on an album … they were just demos for record companies to listen to." Also in 1968, Bob and Rita visited the Bronx to see Johnny Nash's songwriter Jimmy Norman. A three day jam session with Norman and others, including Norman's co-writer Al Pyfrom, resulted in a 24-minute tape of Marley performing several of his own and Norman-Pyfrom's compositions which is, according to Reggae archivist Roger Steffens, rare in that was influenced by pop rather than reggae, as part of the effort to break Marley into American charts. According to an article in The New York Times, Marley experimented on the tape with different sounds, adopting a doo-wop style on "Stay With Me" and "the slow love song style of 1960's artists" on "Splish for My Splash". The Wailers' first album, Catch a Fire, was released worldwide in 1973, and sold well. It was followed a year later by Burnin', which included the songs "Get Up, Stand Up" and "I Shot the Sheriff". Eric Clapton made a hit cover of "I Shot the Sheriff" in 1974, raising Marley's international profile. The Wailers broke up in 1974 with each of the three main members going on to pursue solo careers. The reason for the breakup is shrouded in conjecture; some believe that there were disagreements amongst Bunny, Peter, and Bob concerning performances, while others claim that Bunny and Peter simply preferred solo work. Despite the breakup, Marley continued recording as "Bob Marley & The Wailers". His new backing band included brothers Carlton and Aston "Family Man" Barrett on drums and bass respectively, Junior Marvin and Al Anderson on lead guitar, Tyrone Downie and Earl "Wya" Lindo on keyboards, and Alvin "Seeco" Patterson on percussion. The "I Threes", consisting of Judy Mowatt, Marcia Griffiths, and Marley's wife, Rita, provided backing vocals. In 1975, Marley had his international breakthrough with his first hit outside Jamaica, "No Woman, No Cry", from the Natty Dread album. This was followed by his breakthrough album in the United States, Rastaman Vibration (1976), which spent four weeks on the Billboard Hot 100. In December 1976, two days before "Smile Jamaica", a free concert organized by the Jamaican Prime Minister Michael Manley in an attempt to ease tension between two warring political groups, Marley, his wife, and manager Don Taylor were wounded in an assault by unknown gunmen inside Marley's home. Taylor and Marley's wife sustained serious injuries, but later made full recoveries. Bob Marley received minor wounds in the chest and arm. The shooting was thought to have been politically motivated, as many felt the concert was really a support rally for Manley. Nonetheless, the concert proceeded, and an injured Marley performed as scheduled, two days after the attempt. When asked why, Marley responded, "the people who are trying to make this world worse aren’t taking a day off. How can I?" The members of the group Zap Pow, which had no radical religious or political beliefs, played as Bob Marley's backup band before a festival crowd of 80,000 while members of The Wailers were still missing or in hiding. Marley left Jamaica at the end of 1976 for England, where he spent two years in self imposed exile. Whilst there he recorded his Exodus and Kaya albums. Exodus stayed on the British album charts for 56 consecutive weeks. It included four UK hit singles: "Exodus", "Waiting in Vain", "Jamming", and "One Love" (a rendition of Curtis Mayfield's hit, "People Get Ready"). During his time in London he was arrested and received a conviction for possession of a small quantity of cannabis . In 1978, Marley returned to Jamaica and performed at another political concert, the One Love Peace Concert, again in an effort to calm warring parties. Near the end of the performance, by Marley's request, Manley and his political rival, Edward Seaga, joined each other on stage and shook hands. Under the name Bob Marley and the Wailers eleven albums were released, four live albums and seven studio albums. The releases included Babylon by Bus, a double live album with 13 tracks, was released in 1978 to critical acclaim. This album, and specifically the final track "Jammin'" with the audience in a frenzy, captured the intensity of Marley's live performances. Survival, a defiant and politically charged album, was released in 1979. 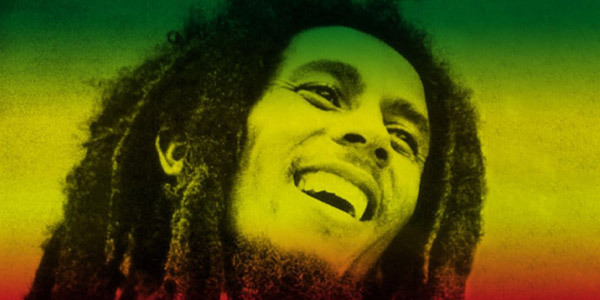 Tracks such as "Zimbabwe", "Africa Unite", "Wake Up and Live", and "Survival" reflected Marley's support for the struggles of Africans. His appearance at the Amandla Festival in Boston in July 1979 showed his strong opposition to South African apartheid, which he already had shown in his song "War" in 1976. In early 1980, he was invited to perform at the April 17 celebration of Zimbabwe's Independence Day. Uprising (1980) was Bob Marley's final studio album, and is one of his most religious productions, including "Redemption Song" and "Forever Loving Jah". Confrontation, released posthumously in 1983, contained unreleased material recorded during Marley's lifetime, including the hit "Buffalo Soldier" and new mixes of singles previously only available in Jamaica. In July 1977, Marley was found to have acral lentiginous melanoma, a form of malignant melanoma, in a wound reportedly picked up in a friendly football match. After the album Uprising was released in May 1980 the band completed a major tour of Europe, where they played their biggest ever concert, to a hundred thousand people in Milan. After the tour Marley went to America, where he performed two shows at Madison Square Garden as part of the Uprising Tour. Shortly afterwards his illness deteriorated and he became very ill, the cancer had spread throughout his body. The rest of the tour was cancelled and Marley sought treatment at the Bavarian clinic of Josef Issels, where he received a controversial type of cancer therapy partly based on avoidance of certain foods, drinks and other substances. After fighting the cancer without success for eight months he boarded a plane for his home in Jamaica. While flying home from Germany to Jamaica for his final days, Marley became ill, and landed in Miami for immediate medical attention. He died at Cedars of Lebanon Hospital in Miami on the morning of May 11, 1981, at the age of 36. The spread of melanoma to his lungs and brain caused his death. His final words to his son Ziggy were "Money can't buy life." Marley received a state funeral in Jamaica on May 21, 1981, which combined elements of Ethiopian Orthodoxy and Rastafari tradition. He was buried in a chapel near his birthplace with his Fender Stratocaster. A month before his death, he had also been awarded the Jamaican Order of Merit. In 1994 Marley was inducted into the Rock and Roll Hall of Fame, and in 1999 Time magazine chose Bob Marley & The Wailers' Exodus as the greatest album of the 20th century. In 2001, he was posthumously awarded the Grammy Lifetime Achievement Award, and a feature-length documentary about his life, Rebel Music, won various awards at the Grammys. With contributions from Rita, the Wailers, and Marley's lovers and children, it also tells much of the story in his own words. In 2006, the State of New York renamed a portion of Church Avenue from Remsen Avenue to East 98th Street in the East Flatbush section of Brooklyn "Bob Marley Boulevard"